Entries tagged with “Dru Fallon O’Neill”. Tomales celebrated its Founders’ Day Sunday with a block-long parade on the main street (Highway 1) followed by a picnic in the town park. The theme of this year’s celebration was Taste of Tomales. Although the number of parade participants was smaller this year than last, the party that followed packed the park. Parade announcer Dru Fallon O’Neill (at right) welcomes a miniature train complete with adults, kids, and even a dog. The entry drew attention to the West Marin Review. 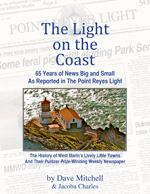 Each year Point Reyes Books plus neighbors and friends — Madeleine Corson (holding the leash), Steve Costa, Doris Ober — publish the Review, a collection of writing and art. The first issue appeared in 2008. In 2010, the Review received a design award from the New York Book Show. — Lynn Axelrod contributed most of the photos used in this posting, including the one above. On the other hand, one “well-known fact” about Javier, Dru added, is that “he’s a huge supporter of the Athletic Club of Bilbao soccer team from Spain.” Two years ago, the club, which recruits players who learn their skills in Basque Country, had one of the best records in Europe. John Sanchez at the wheel of his 1950 Farmall tractor pulled a trailer carrying his family in the parade. A small but enthusiastic contingent of Tomales High cheerleaders took part in Sunday’s parade. Moe and Monica Boudens from Mass Wiggle used a 1950 San Francisco firetruck to promote vermi compost, tea, and worms. The ever-popular Ehecatl Aztec Dance Group from Santa Rosa danced to the beat of two drums. Tomales Presbyterian Church used the parade to publicize its upcoming sesquicentennial anniversary. Again this year, Jeff Etamad of Tunnel Hill Ranch in Tomales led his llama named Crunch in the parade while his son Cam brought up the rear holding the leash of a Golden Doodle named Lucky. Wayne and Kim Simoni of Sebastopol entered a 1910 Packard in the parade. Wayne said there are only four of these cars left in the world. Kim noted the car had previously belonged to a man in Pennsylvania and that they had spent years convincing him to sell it to them. They finally got the car two years ago, she said. Tomales Girl Scouts Troop 10988 showed up in force for the parade. Shannon Hobbs and Jason McLean of Marshall rode in an octogenarian pickup truck with a stuffed bobcat on its hood. A 1949 Ford truck in Sunday’s parade publicized Tomales Farm and Flea Market, which will be held from 9 a.m. to 3 p.m. Sunday, Oct. 19, at John and First streets in Tomales. To this little girl’s delight, the Hubbub Club Marching Band from the Graton-Sebastopol area of Sonoma County kept on playing for the Founders’ Day crowd after the parade ended. Tomales Town Park filled up with celebrators after the noontime parade. All manner of food, drinks, produce, and crafts were for sale under a couple of dozen canopies. Little Organic Farm, which is located on the Tomales-Petaluma Road between town and the Coast Guard Training Center, offered an abundance of heirloom potatoes, along with other vegetables. Among the crafts for sale were birdhouses, an owl box, and a bat house. Tomales Volunteer Firefighters, as they do each year, had their own booth for recruiting new volunteers. Dru (at left) also took note of the “glorious weather” and her “gratitude for the volunteers, especially the traffic-detail/crowd-control crew led by Eddie Byrd with help from townsfolk, Coast Guard volunteers, and local FFA. “Set-up/cleanup under the auspices of David Judd [was] aided by Walter and Margaret Graham. We could not operate such an event without all of the behind the scenes talent. Tomales held its annual Founders Day celebration Sunday with a parade up the main street, which is Highway 1 and which was closed to traffic for the duration. The parade, which keeps getting bigger each year, was followed by a picnic in the Tomales town park. Firetrucks were a major part of the parade. Most were from the Marin County Fire Department although two were from as far away, so to speak, as Bloomfield in Sonoma County. In a booth at the picnic, Marin County firefighters encouraged Tomales-area residents to join the town’s volunteer fire department. The banner refers to the Marin County Household Disaster Preparedness website. Steve Kinsey, the Marin County supervisor who represents West Marin, rode in a Lamborghini. He had been originally scheduled to ride on a tractor, but it broke down. Bruce Bramson of Tomales got on the phone for three hours and eventually found Kinsey the elite sportscar for his chariot. Jeff Etamad of Tunnel Hill Ranch in Tomales led his llama in the parade. Members of the Redwood Empire Harley Owners Group (HOGS) followed a convoy of firetrucks at the beginning of the parade. The group says that by raffling off a Harley Davidson motorcycle each year, it has raised nearly $1.8 million over the past 10 years for the Meals on Wheels program. Standing on a balcony above the Continental Hotel, Dru Fallon O’Neill (left) and Bert Crews, both of Tomales, were the parade announcers this year as they have been in the past. A 1931 Ford Model A roadster pickup owned by the Simoni family of Sebastopol, Sonoma County. Another Norman Rockwell moment in West Marin: two youngsters and two goats were passengers in the bed of a beat-up, old, farm pickup truck with a KWMR community-radio bumper sticker. The Tomales High cheerleaders stopped along the route to perform as they marched in the parade. A shack on a trailer promoted Valley Ford bird houses. Cameraman at work: Kenzmyth Productions is beginning to film a documentary on Loren Poncia of Tomales. Loren’s parents Al and Cathie Poncia for years operated a dairy ranch, which they eventually converted to a beef ranch, beside Stemple Creek. The ranch was established in 1902 by Al’s grandfather, who immigrated to Marin from Garzeno, Italy, in the 1890s. Loren is the fourth generation to operate the ranch. A breakdown in literacy: The Marin County Mobile Library, which was helping bring up the rear of the parade, broke down for real along the route and — after some delays and jokes from the parade announcers — had to be towed most of the way. The Hubbub Club Marching Band from the Graton-Sebastopol area of Sonoma County was a hit of the parade. At the end of the parade they gave a brief performance at Highway 1 and Dillon Beach Road and then moved on to the beer garden at the William Tell House for a full set. The Ancient and Honorable Order of E Clampus Vitus marches past the food and crafts booths set up for the picnic in Tomales Town Park. The Clampers, a fraternal organization dedicated to the study and preservation of Western heritage, has memorialized events in Tomales history. Many picnickers in the park took advantage of a dining tent to escape the heat of the sun. The band Wagon, whose members hail from Tomales, San Rafael, and Oakland put on a good show for picnickers in the park. Sparsely Sage and Timely is powered by	WordPress 4.9.10 and delivered to you in 0.728 seconds using 50 queries.